*A CNN reporter was cursed out on live television this afternoon while interviewing an exhausted woman just moments after she and her children escaped rising flood waters in Houston. Just before 2 p.m. ET, correspondent Rosa Flores spotted a woman who had waited for days to be rescued from her home and approached her with cameras rolling. “We had been there five days with no food, no lights, and nobody came. Nobody came,” the woman said. “We walked through four feet of water to get them food on the first day. Yeah. that’s a lot of sh*t,” the woman said, before the frustration of her ordeal was unleashed on Flores. “Sorry. Sorry,” was all Flores could say. Anchor Jim Acosta cut in. “It sounds like you’ve got a very upset family there. We’re going to take a break from that and we’ll get back to you later on,” he said, throwing to a commercial. After the break, Acosta and Flores apparently decided it was best to discuss what just happened. I understand that the woman was frustrated, but she should have just walked away. 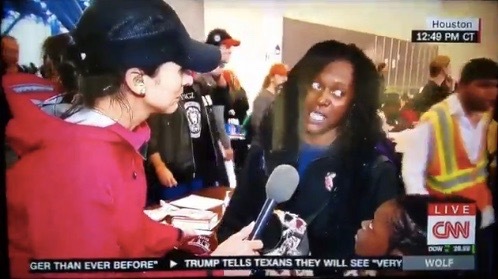 Nobody forced her to stand there and be interviewed. The reporter did nothing wrong. True, she could have said I don’t want to talk now. She probably did realize how tired and upset she was until she start talking.